I check the forecast almost every day, especially on cold and clear days. This afternoon when I looked at the forecast it was a level 3 which usually means there's little chance of viewing the Aurora. By 9pm reports were coming in from as far south as Minnesota and the reading was up to level 8. So we grabbed the gear as fast as we could and headed out on the hunt. It didn't take us long to find it! There were great displays tonight but the most interesting part for us was hearing the water freeze around us. Often we are in the middle of nowhere, in the dark and on our own, so hearing giant cracking filled us with impending doom until we figured out what it was! I've not shot in temperatures this cold since I was in the Arctic and it's a whole different experience. Great night! 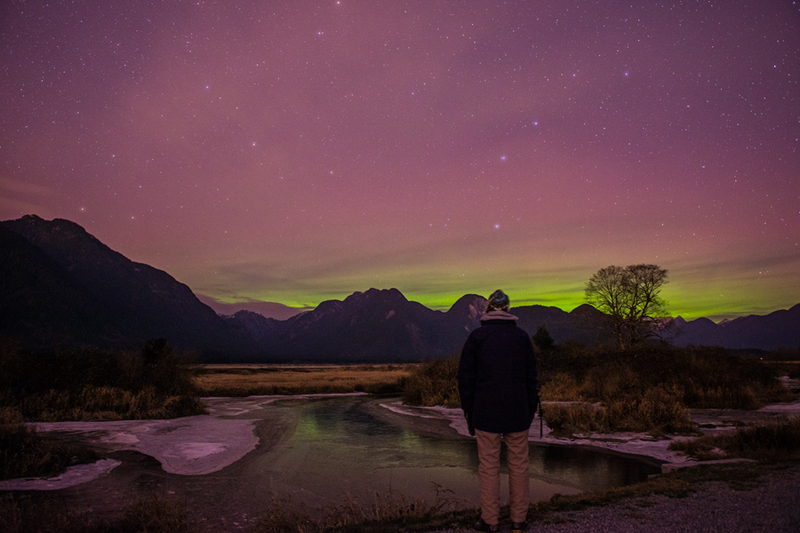 Freezing night at Pitt Meadows, British Columbia. Freezing night in Pitt Meadows, British Columbia. Freezing Aurora. Pitt Meadows, British Columbia.